Studio 5380: Trick or Treat! Aren't you glad it's Friday? This has been a busy week for me and I'm ready for the weekend. And for those of you who commented on my last post - NO...that stinkin' House-Cleaning Fairy NEVER did show up! I think maybe she found a better position elsewhere! Aren't these little guys cute? So, how great is that? A great excuse to make a project with CANDY and a chance to win some fabulous stamps - win, win! Ok - that's my "Candy-Licious" project! I hope you will hop on over to the Pause Dream Enjoy Challenge Blog and see all the wonderful projects the Design Team has put together for your inspiration! Thanks for stopping by and I hope you have a wonderful weekend! These are really fun and I'm sure they will love them! Yes, Tanya, they are adorable. Love the glitter glitter, makes his face pop. 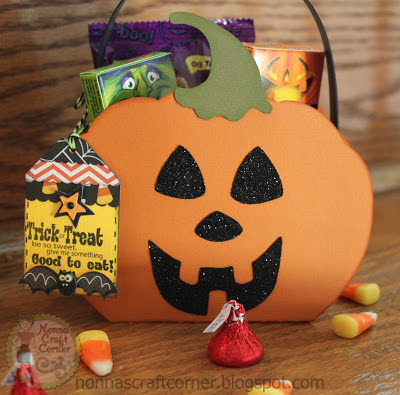 Like the candy treat containers creations including yours I've seen made with the Silhouette Cameo. Have a friend that lieks hers better tban the Cricut which she also has. I have the Cricut. Hubby got me the Tim Holtz Vagabond. Wonder if he will get me the Cameo? Great to be part of PDE DT. Happy Halloween. Hope you get lots of treats. Tanya ~ Oh these are too CUTE!! I LOVE that you got so much candy in them!! CUTE, CUTE cut!! Love the glittery faces and those tags ~ eek ~ PERFECT!! Well I did crack up on the post too! She must have gotten a better position! I am all for that but notice would have been nice! LOL!! Have a FABULOUS weekend and CONGRATS on the PKS top 3!! YEAH!! These are absolutely adorable treat bags and I bet your grandsons loved them! Oh my, what a delightful Halloween treat! You just always create the most adorable things. That darn fairy, she missed my house as well. Have a terrific weekend. Those are adorable! Love the glittery faces! THIS IS SO SUPER CUTE-- I love that cute- I'm gaining weight looking at the candy. These are fantastic pumpkins, love the little tag too! 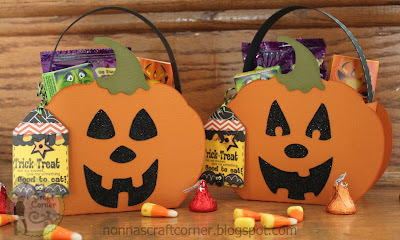 Love your pumpkin treat bags.Love, love the glitter. MS seems to make the sparkliest glitters doesn't she. How fun are these! The tags are so fabulous, great paper! I'm sure the boys are going to love these! They look so yummy!!! Oh and that house cleaning fairy sure didn't take a position at my house! I was stuck doing 4 loads of laundry, one sink of dishes and vacuuming a house full of dust! Your kidding...what happen to the cleaning fairy! I would SO fire her, haha! Your little pumpkin baskets are so cute! I am sure Blake and Brayden will love these. Especially, the yummy chocolate inside! These are fantastic! !So Fun and Yummy!